This page is designed help you to get started using Delphi 2007 to write form-based applications. You can use Delphi 2007 in a very similar way to Delphi 7; the menus, icons and short-cut keys learned for the earlier version make the transition seamless. After a little practice, you should find that Delphi 2007 is easier to use. We point out some significant differences here. When you save the project, the .dpr file contains the code and the .dproj file contains project information in xml format. 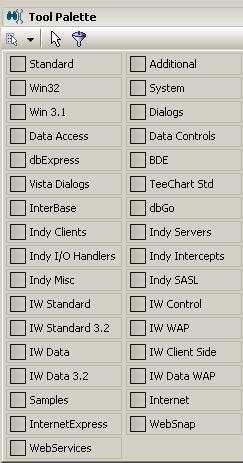 There are many more components in Delphi 2007 than in Delphi 7. Click on the category name of the above view to see the components in that category in the Tool Palette. To set a filter, click anywhere in the Tool Palette and begin typing the name of the item you want to locate. The Tool Palette displays only those items that contain in their names the string of letters that you type. This screenshot shows an example after typing "TBu" within the Tool Palette. Click the filter icon to remove the filter. At the bottom of the Delphi window you can select the Code or Design tab to switch conveniently between the text editor of the unit and the design view of the form. The Project Inspector is available permanently at the top right of the main window. To obtain the source code of the project file, select the menu item Project > View Source. You will notice the line Application.MainFormOnTaskbar := True; that is not generated in Delphi 7. In the editor, a curly red line under your code indicates an error. In the editor (as with Lazarus), you can fold a block of code such as a procedure by clicking on the - symbol to the left of the start of the block.